God is understood by different religions differently, due to the different time, place and circumstances in which God reveals His divine message. He does so due to the differing of consciousness, capacity and spiritual realisation of the audience to receive His message. Prophet Mohammed was revealed by Allah three kinds of knowledge - one which he was allowed to share with his followers, the second type he had the discretion to share or withhold, and the third category of revelation he was strictly forbidden from sharing. (Nadar Beg K. Mirza, 'Reincarnation and Islam', and Geo Widengren, 'Muhammad the Apostle of God and his ascension', page 108). Hence Muhammad never revealed to his followers the knowledge of the most attractive Lord Krishna. 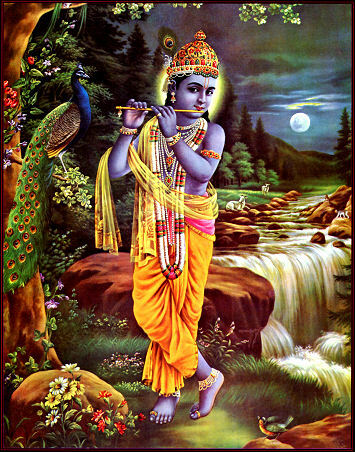 Krsna (कृष्ण) or Krishna means 'All attractive'. A person is attractive if He possesses unlimited beauty, knowledge, strength, fame, riches or renunciation. Generally, an ordinary person of this world may possess any one of these six opulence’s, and even that is limited and subject to destruction by the force of time. 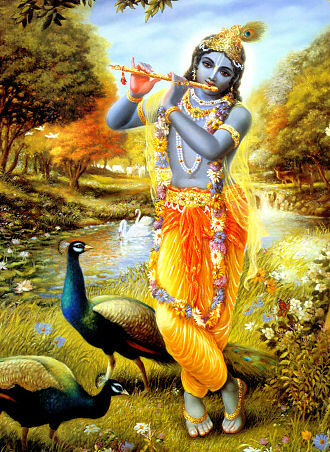 Krishna alone possesses not only all the six opulence’s but He has unlimited abundance. Thus Krishna, who is known to Muslims as Allah, or to the Christians as the Almighty father Christ, or as Jehovah or Yahweh to many, is the most complete and attractive understanding of God. God is not only a beautiful person but He also possesses a wonderful form. Srimad Bhagavatam reveals God has an eternal spiritual body that is full of knowledge and bliss (satcitananda). Gods body is different from what we possess in this material world- namely a material body composed of stool, urine, puss, mucus and bile. 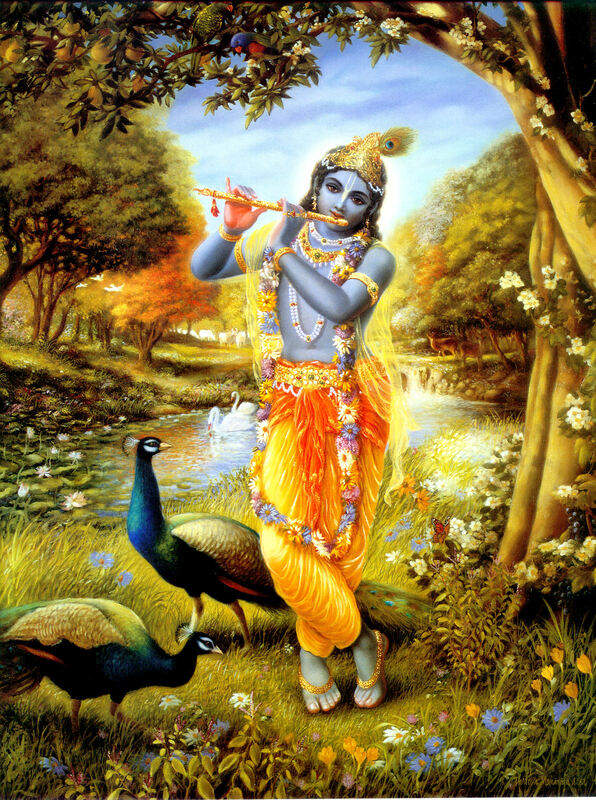 But God Krishna has a spiritual form, which is of a beautiful blackish complexion like a monsoon cloud. The Sanskrit word KRISHNA has the literal meaning of 'black', 'dark' or 'dark-blue', and is used as a name to describe someone with dark skin. Krishna is often depicted in murtis as black, and is generally shown in paintings with blue skin. 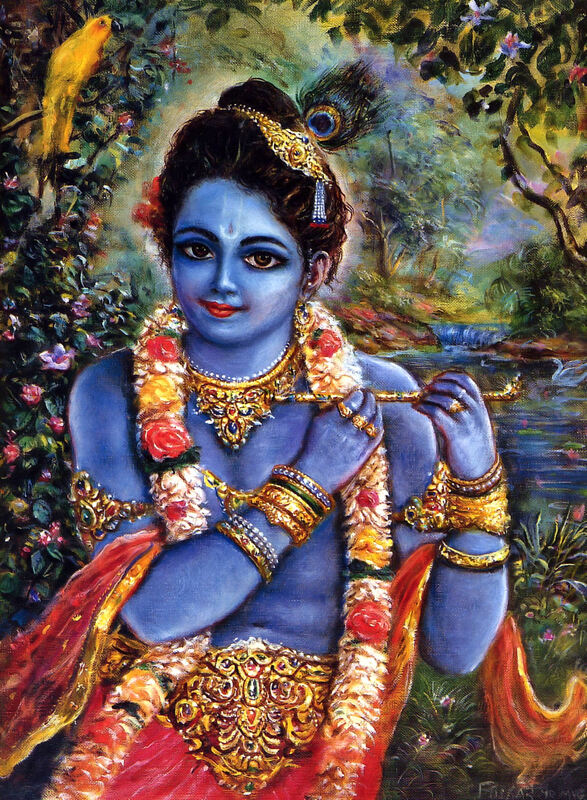 The lotus-eyed, dark skinned Krishna is the complete and perfect understanding of god. 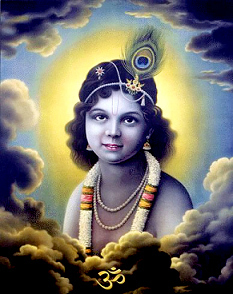 Krishna is also called "Śyāma", the blackish one, or the beautiful dark boy with a blakish color. When Lord Śrī Kṛṣṇa was personally present in the mortal world in His eternal, blissful form of Śyāmasundara, those who were not pure devotees of the Lord could not recognize Him or know His glories. Avajānānti māṁ mūḍhā mānuṣīṁ tanum āśritam (Bg. 9.11): He is always bewildering to the nondevotees, but He is always seen by the devotees by dint of their pure devotional service to Him. Srila Prabhupāda: Kṛṣṇa is called Śyāmasundara. Śyāma means blackish, but He's very beautiful, sundaram means very, very beautiful. Śyāmasundaram acintya-guṇa-svarūpaṁ. Acintya means inconceivable. His qualities, His transcendental qualities, are inconceivable. When in the Vedic literature it is said that God is quality-less, nirguṇa, nirguṇa means He is transcendental to these material qualities. But His transcendental qualities are there. So He is called that acintya-guṇa-svarūpaṁ govindam. We just offer our prayers, three verses only from this Brahma-saṁhitā, before our this recitation of Śrīmad-Bhāgavatam. That Govinda is the original Personality of Godhead, and Śyāmasundara, with a flute in His hands, and He is always smiling. And by His smiling He offers you blessings. You also, by seeing His smiling, you remain everlastingly smiling. It is so nice. This is also hinted in the Quran - the sura "Al-Baqarah" or "The Cow" of the Holy Qur'an, there is a specific verse which hints at this: Sibgatallah wa man 'ah - sanu minallahi sibgah: " (We take our colour from Allah and who is better than Allah at colouring?" (2.138) The word sibgat is significant in this verse. The root meaning of this word is colour. In this verse it is explained that none can surpass Allah in lending colour to this universe. There is no colour that Allah doesn't have, and none that He is not adorned by. Had He not been so adorned, then He will be less than His creation. The very thought of such offensive minimization of Allah is wholly unacceptable by anyone who professes to be a true Muslim. This is because no Muslim will dare contradict the Qur'anic statement: 'Allahu Akbar'(Allah is Great). Since Allah is the greatest, how can the Great Allah be colourless, or a mere abstraction? The answer ist hat Allah is colourfully beautiful. Allah is the most beautiful Person. Prophet Muhammad said: "My Lord came to me in the most beautiful image"
Prophet Muhammad said to his asabas [associates]: "We take our colour from Allah." This means that the colour of the Arabs analogously resembled Allah's colour. From the representation of Allah's complexion by the Arabs, we can safely conclude that Allah is of a beautiful dark complexion. Of course, this colour of God is not material but spiritual. When Prophet Muhammad met Allah (Vishnu or Krishna), he saw dazzling effulgence emanating from God. Therefore, Allah has a dazzling dark colour-contradictory to mundane senses but transcendentally beautiful. According to recognized Vedic scriptures, Allah or Krishna has a spiritual, dazzling, dark colour, beyond the perception of the material senses and the imagination of the mundane mind. Sibgatallah wa man 'ah - sanu minallahi sibgah: "Allah possesses beautiful dark color", "We take our Color from Allah. Who is better than Allah at coloring?" Actually Allah being the source of everything it is no wonder that some color of this material world should resemble His, although His color is not material. Allah is not only discribed as light, but also as the "posessor of light"
Then it continues: Masalu Nuurihii…… Nuurihii means “His light”. So Allah is not only light but also possesses light. So from the statements of Al-Quran we can understand, that the image of Allah is of a beautiful dark color, surrounded by a dazzling light. While the Quran only states, that Allah has a beautiful dark color, the vedic scriptures discribe in much more detail the dark color of Lord Krishna. 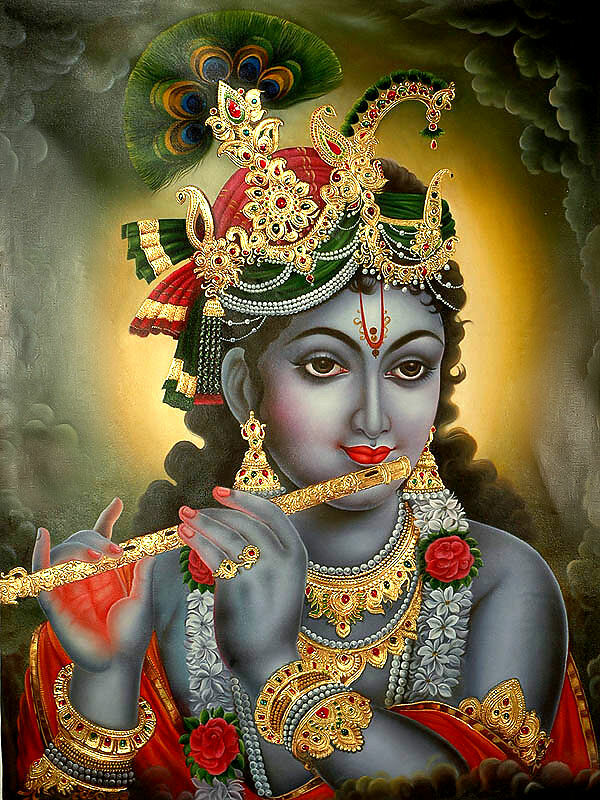 कृष्ण Kṛṣṇa (Sanskrit, alternate spellings Krsna, Krishna, "black" or "dark blu e") - Krishna literally means "the dark one" or even "the black one"; sometimes, in poetry, the colour of Krishna is compared to "a dark blue rain cloud in the monsoon season. Krishna's Color is described in most of the vedic reference books as Megha-Varnam. i.e. the color of dark rain clouds that are filled with water or clouds that are ready to shower rain. 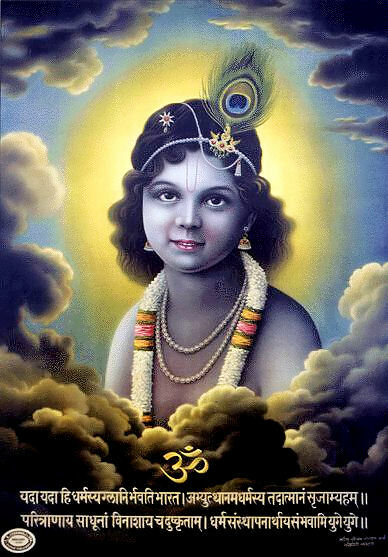 Krishnas color is therefore compared to a blue-blackish rain cloud in the monsoon season. Srila Prabhupāda: Yes. 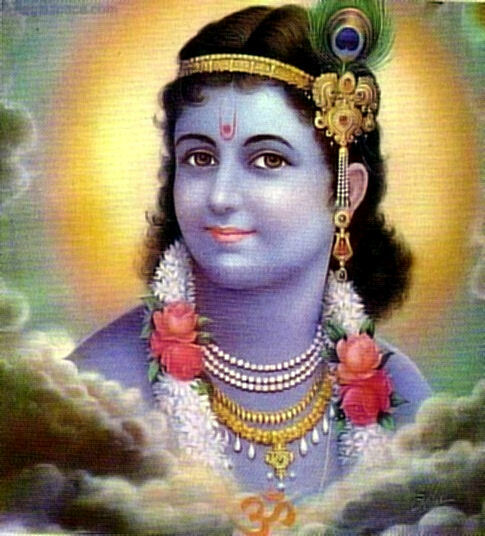 Kṛṣṇa is bluish. Kṛṣṇa's color is like the sky. 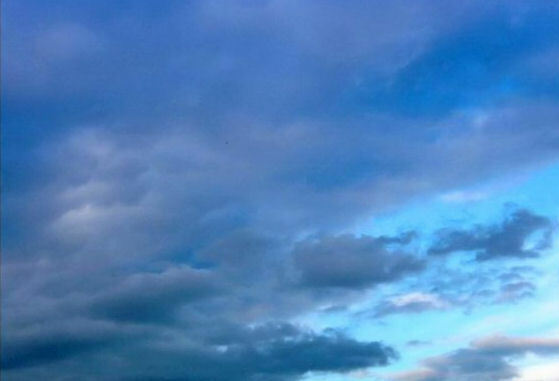 When you see the clear sky, bluish sky, are you not very happy? "Oh, today is very nice day, blue sky." Especially in this country, when the sky is always overcast with cloud. So why you appreciate the color of the sky so much? That is Kṛṣṇa's color. Kṛṣṇa's body, there is a ray, brahmajyoti. That brahmajyoti is reflected in the sky. That brahmajyoti is outside this material sky, but that is being reflected. Therefore the sky's color, it appears bluish. Krishna, the dark-coloured-one, has a beautiful complexion like that of a raincloud in the monsoon season. As per the ancient writings the colour of lord Krishna is Black or darkish blue. He is been called as Shyama which means Black. The colour black depicts rain clouds and the colour blue depicts sea and sky which corresponds to 'ananth' or never ending (infinity). Further, the paintings of face of all the avatars of Lord Vishnu are always discribed as blue coloured. For people whose life depended on rain clouds for a good crop yeild, there can be nothing more refreshing, enlivening, joyous, or celebratory than a dark rain cloud, bringing life giving rain to the fields, streams, and mountains. They are seen with eyes colored by prema... prema anjana churita. Those who see Krsna with eyes not colored by prema will see something else. "You appear in a color which is compared to that of a blue-blackish cloud"
The transcendental personal forms of the Lord, such as Śyāmasundara, are a mystery, and the symptoms of these forms, which are absolutely different from anything made of mundane elements, are also mysterious. Apte's Sanskrit dictionary gives the meaning of atasī = common flax/Hemp/linseed/ and the botanical name is 'Linum Usitatissimum, Linum Perenne. Monier-Williams tells us that the atasī is the "common flax, Linum usitatissimum." This highly useful, long cultivated plant provides the fiber that are the source of linen fabrics. Its seeds are rich in lignans and Omega-3 fatty acids, beneficial to health. The flower of the common flax, it turns out, is light blue. 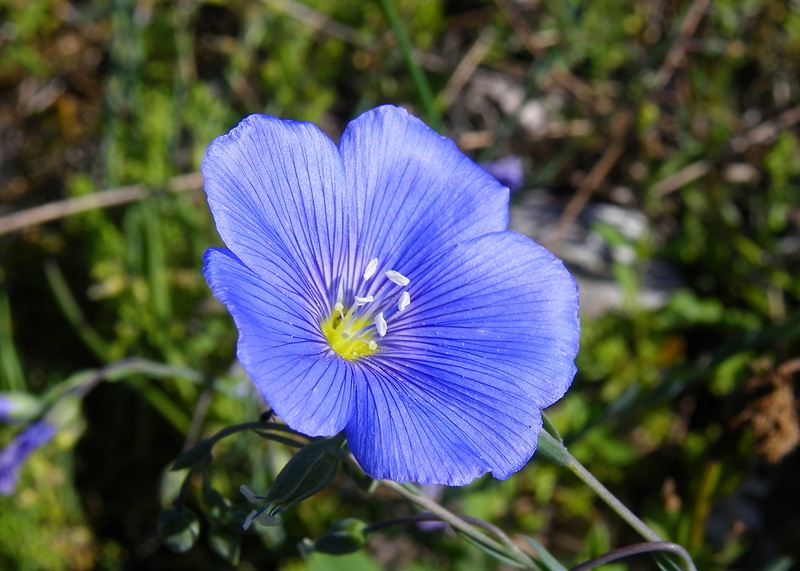 However, there is one variety of flax (Linum perenne, the "perennial flax") that does bear a dark blue flower. This, then, seems to be the śyāma in Śyāmasundara (Kṛṣṇa the beautiful dark blue boy, whose color resembles the atasi flower). Śyāmasundara, "beautiful Śyāma, Kṛṣṇa." Yaṁ śyāmasundaram acintya-guṇa-svarūpam. He's śyāma -śyāma means blackish- but at the same time, the most beautiful. Here in this material world, if somebody is blackish, he cannot be called beautiful. But Kṛṣṇa, although He is blackish, He is sundaram, very, very beautiful. How much sundaram? Kandarpa-koṭi-kamanīya-viśeṣa-śobham [Bs. 5.30]. Kandarpa-koṭi. If you keep one side millions of Cupids, still, Kṛṣṇa will appear more beautiful. Yasya prabhā prabhavato jagad-aṇḍa-koṭi koṭiṣv aśeṣa-vasudādhi vibhūti-bhinnam [Bs. 5.40]. It is stated in the Brahma-saṁhitā, "On account of distribution of the rays of His body, the brahmajyoti, there are generation of innumerable universes." So all these universes—this is one of the universes—they are in that brahmajyoti, and that brahmajyoti is being reflected in the sky, and sky is so beautiful. So how much beautiful is Kṛṣṇa, just we can imagine. Just like the sunshine. The sunshine is the rays of the sun planet, and in the sun planet there is sun-god. So if sunshine is so pleasing, just imagine how the sun-god is pleasing. Similarly, Kṛṣṇa's jyoti, brahmajyoti, is so important. Then just imagine how Kṛṣṇa's beauty is appreciated in transcendental world. Yaṁ śyāma-sundaram acintya-guṇa-svarūpaṁ. Barhāvataṁsam asitāmbudha-sundarāṅgam. Barhāvatāmsam asitāmbudha. His color is compared with the blackish cloud, asitāmbudha, sundarāṅgam, but very, very beautiful. “Dear Lord,” the demigods prayed, “when You appear in Your different incarnations, You take different names and forms according to different situations. Lord Kṛṣṇa is Your name because You are all-attractive; You are called Śyāmasundara because of Your transcendental beauty. Śyāma means blackish, yet they say that You are more beautiful than thousands of cupids. Kandarpa-koṭi-kamanīya. Although You appear in a color which is compared to that of a blackish cloud, You are the transcendental Absolute, and therefore Your beauty is many, many times more attractive than the delicate body of Cupid. “I worship Govinda, the primeval Lord, who plays on His transcendental flute. His eyes are like lotus flowers, He is decorated with peacock plumes, and His bodily color resembles the color of a fresh black cloud, although His bodily features are more beautiful than millions of Cupids.” This beauty of the Supreme Lord can be seen by devotees who are in love with Him, devotees whose eyes are anointed with love of Godhead (premāñjana-cchurita-bhakti-vilocanena [Bs. 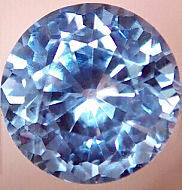 5.38]). 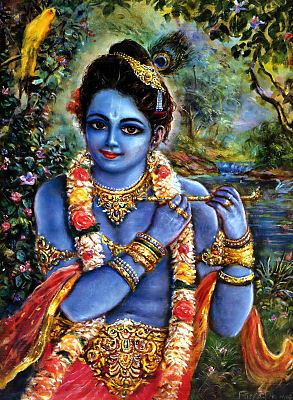 Sometimes Krishnas complexion is compared to the color of blue sapphires (indra-nila-mani). It is not a colour we can find in this world; that we can see with our material eyes. 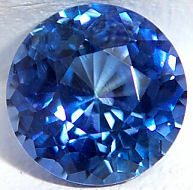 It is the colour of God. Those who have seen it have tried to describe it as the hue of blue clouds, as freshly-formed rainclouds, as the beautiful colour of the syama flower, etc. It would seem that when Kṛṣṇa refers to a colour it means black, but when Kṛṣṇa refers to the Supreme Lord, it means the All-Attractive Person, Śrī Kṛṣṇa. "Krish" - all attractive and "na" - Person. Why He is called this is self-evident, for certainly no one else can be so called. SB 10.2.36, Purport: "I worship Govinda, the primeval Lord, who plays on His transcendental flute. His eyes are like lotus flowers, He is decorated with peacock plumes, and His bodily color resembles the color of a fresh black cloud, although His bodily features are more beautiful than millions of Cupids." This beauty of the Supreme Lord can be seen by devotees who are in love with Him, devotees whose eyes are anointed with love of Godhead. Srila Prabhupada: In the Brahma-saṁhitā (5.38) it is stated, premāñjana-cchurita-bhakti-vilocanena: only a person whose eyes are smeared with the ointment of love can see the beautiful form of Śrī Kṛṣṇa. We are worshiping Govinda, the Supreme Personality of Godhead, the original person. And this song we were just singing —govindam adi-purusam tam aham bhajami— is reaching Him. He’s hearing it. You cannot say He’s not hearing it. Especially in this scientific age, when radio messages are broadcast thousands and thousands of miles so you can hear them, it is easy to understand how Govinda, Krishna, can hear your sincere prayer. TRANSLATION - I worship Govinda, the primeval Lord, who is Śyāmasundara, Kṛṣṇa Himself with inconceivable innumerable attributes, whom the pure devotees see in their heart of hearts with the eye of devotion tinged with the salve of love. PURPORT - The Śyāmasundara form of Kṛṣṇa is His inconceivable simultaneous personal and impersonal self-contradictory form. True devotees see that form in their purified hearts under the influence of devotional trance. The form Śyāma is not the blue color visible in the mundane world but is the transcendental variegated color affording eternal bliss, and is not visible to the mortal eye. On a consideration of the trance of Vyāsadeva as in the śloka, bhakti-yogena manasi etc., it will be clear that the form of Śrī Kṛṣṇa is the full Personality of Godhead and can only be visible in the heart of a true devotee, which is the only true seat in the state of trance under the influence of devotion. When Kṛṣṇa manifested Himself in Vraja, both the devotees and nondevotees saw Him with this very eye; but only the devotees cherished Him, eternally present in Vraja, as the priceless jewel of their heart. Nowadays also the devotees see Him in Vraja in their hearts, saturated with devotion although they do not see Him with their eyes. The eye of devotion is nothing but the eye of the pure unalloyed spiritual self of the jīva. The form of Kṛṣṇa is visible to that eye in proportion to its purification by the practice of devotion. When the devotion of the neophyte reaches the stage of bhāva-bhakti the pure eye of that devotee is tinged with the salve of love by the grace of Kṛṣṇa, which enables him to see Kṛṣṇa face to face. The phrase "in their hearts" means Kṛṣṇa is visible in proportion as their hearts are purified by the practice of devotion. The sum and substance of this śloka is that the form of Kṛṣṇa, who is Śyāmasundara, Naṭavara (Best Dancer), Muralīdhara (Holder of the Flute) and Tribhańga (Triple-bending), is not a mental concoction but is transcendental, and is visible with the eye of the soul of the devotee under trance. "I worship Govinda, the primeval Lord, round whose neck is swinging a garland of flowers beautified with the moon-locket, whose two hands are adorned with the flute and jeweled ornaments, who always revels in pastimes of love, whose graceful threefold-bending form of Syamasundara is eternally manifest."